It's been a crazy week. Racing down to visit mum and dad in Palmy after hearing about Dad's heart attack. Beating the nanovirus and making it in to visit Dad, when no-one else in the whole hospital was allowed visitors. Being away from my babies for three nights; missing them but knowing they were in good hands with their awesome daddy. Hearing that Dad had been flown to Wellington for his angiogram... and getting the news that he has three majorly blocked heart valves and needs triple bypass surgery. Wow. That's so big. I think the stress of it all started to catch up with me. Subconsciously. In my mind I am so grateful to God for alerting us to this ticking time bomb inside my dad's chest. But underneath it all it must be getting to me. Yesterday I was outside playing with Scrag and started feeling dizzy, so I leaned against the garage door. Next thing I knew I was lying on the concrete shaking (and yelling), with bleeding hands and knees. I had bla cked out. 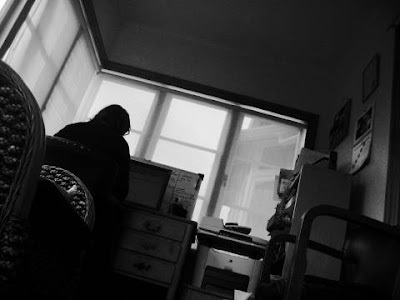 Thank goodness Penny was there doing work for Mr G out in the office; She heard the shouting and came running. 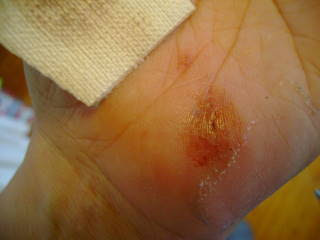 She was able to help me get Scrag in bed, pick the gravel out of the cuts, disinfected my hands and put a bandage on. I had to lay down on the couch and take it easy for the rest of the day. I was meant to be going to my friend Lisa's house in the afternoon; so I had to ring her and postpone. Today at Dash's soccer game I went dizzy again and had to lean on another friend for support. What the heck?? Is it the stress/breathing thing the specialist was talking about. I think so. Well... just to make my day, what turns up in the letterbox...? 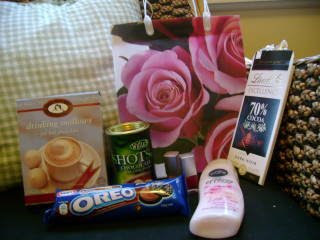 A lovely Care Package full of goodies dropped off by Lisa, bless her! So in the midst of all the downers there's lots to be thankful for. Dad is having his Op on Tuesday - there's another miracle (that's it's going to be so soon). So thanks again to all of you who have offered up prayers and sent messages of care and support to me and my family. You don't know how much it means. Ouch! Glad you are on the mend and hope your Dad is too! Wowee Simoney. Thinking of you girl. Big hug from over the pond.